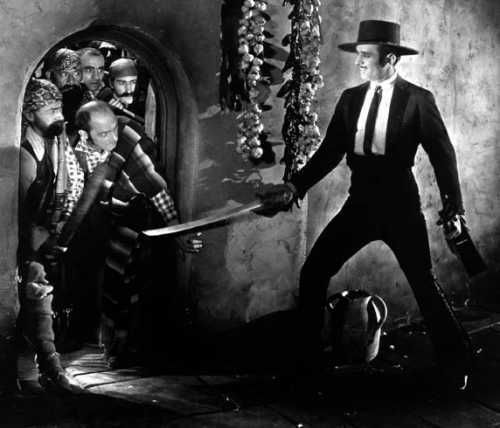 Ninety years later, it’s still easy to see why Douglas Fairbanks’ adventure films made the money they did. Fairbanks was the lighthearted trickster onscreen; a man who dispatched all manner of threats with total confidence; won the pretty girl with a combination of charm and skill, and did it in exotic places. For the factory worker, the desk jockey or the housewife, this was escapism; and a safe investment, too. Fairbanks’ ‘big’ productions, like The Mark of Zorro (1920), Robin Hood (1922), and The Black Pirate (1926), were all of one type: reliable mixes of drama, action, romance and laughs that you could count upon to entertain you when handing over your cash. This makes them predictable, but not necessarily good. I’ve often found Fairbanks’ work hokey and formulaic; his stock character, while charmingly upbeat, is so many steps ahead of his enemies that he rarely seems imperiled. No peril, no drama. Joie de vivre gives way to mere silliness, and I begin to feel overtaxed, since his films aren’t particularly short, either. Don Q, Son of Zorro has these same flaws, but I liked it alright. Maybe because it maintains a balance some of the others don’t—allowing a talented supporting cast to carry more of the relevant screen time. Or maybe because it feels more… brisk? Sure. Don Q is brisk, and Fairbanks’ eponymous character moves through it briskly. How Don Q moves is, I think, the thing I want focus on most. I’d like to see the ratio of Don Q scenes that conclude with Fairbanks still in them to those from which Fairbanks is seen to exit. And of the latter, a second ratio: exits stage-left and -right versus exits straight up. The vertical always seems to be an option for Don Q—always there’s a ledge or a haycart or something like that upon which he can leap to escape danger, cut down his commute, or conclude a conversation. That’s how the Son of Zorro bids goodbye to Dorlores de Muro (Mary Astor), the lovely noblewoman he meets on his Spanish tour. This is not his attempt to impress her; it’s simply who and what he is. For Don Q, the world is full of multi-directional pathways: the type you and I can imagine, perhaps, but lack the wit and athletic prowess to find and exploit. A comparison might be the early work of Fairbanks’ friend and business partner, Charlie Chaplin. The Tramp could make something out of anything. That’s why great slapstick, contrary to its image, is the most profound comedy: because it demands that we view everyday objects and situations as triggerpoints for creative action. It frees one’s emotions, and I find it innately hopeful about the human condition. What Chaplin did with props, I believe Fairbanks accomplished with sets and space. To make a modern comparison: watching Don Q for the first time is a bit like the moment many gamers of my generation had when the arena-style games we played began featuring truly interactive environments. There was still a goal to achieve, but if you wished to hop on a ledge, or sidestep left and look at your reflection in a puddle, you could do that, and you might even be rewarded for it. To be freed from the strict boundaries of the quest: that was exhilarating. Regardless, one of strengths of Don Q is that Fairbanks doesn’t have to shoulder the whole load. Astor delivers more than is required of her, which is more than you can say for some of his leading ladies (see The Black Pirate); while Donald Crisp suitably glowers as Don Sebastian, a Spaniard who secretly murders the visiting Austrian Archduke, then has Don Q framed for it. Crisp, who also directed the film, doesn’t exude charisma in this role, but that’s the point: to be a sullen bore is to be the antithesis of Douglas Fairbanks. Noteworthy, too, is Jean Hersholt, playing degenerate social climber Don Fabrique Borusta. Borusta is a small man on the periphery of big things; his one talent is listening and soon, he hears enough to blackmail Don Sebastian and secure himself a governor-style position. Hersholt played a lot of scumbags in the 1920s, and had a gift for elevating them as characters. In every way but the most bluntly physical, his Borusta is a greater threat to Don Q than Sebastian is. Were he the main villain, rather than an irritant, Don Q would have been a more compelling film, though not a better action film. 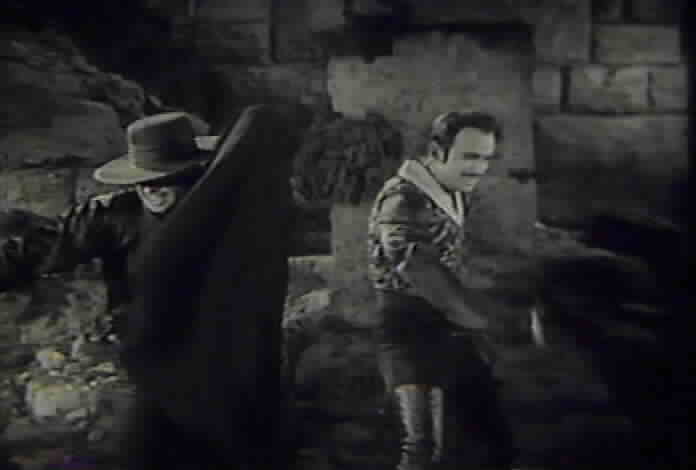 Fairbanks himself plays a duel role: both Don Q and Don Q’s father, Zorro. (Fairbanks’ then-wife, Mary Pickford, achieved a similar trick back in 1921, playing a mother and son in Little Lord Fauntleroy). Father and son are identical but for aging makeup, and the makeup’s so good you can imagine what Fairbanks would have looked like, had he lived into his sixties. The action sequence shared by Don Q and his dad was my favourite in the film. Like many of Fairbanks’ blockbuster features, Don Q isn’t about very much. The film’s pleasure is found in watching the kinds of events you were hoping to watch, and its quality is measured in its capacity to deliver those events, one after the next, without a stutter. If you stopped to think about Don Q, then suddenly, it might not be your cup of tea. 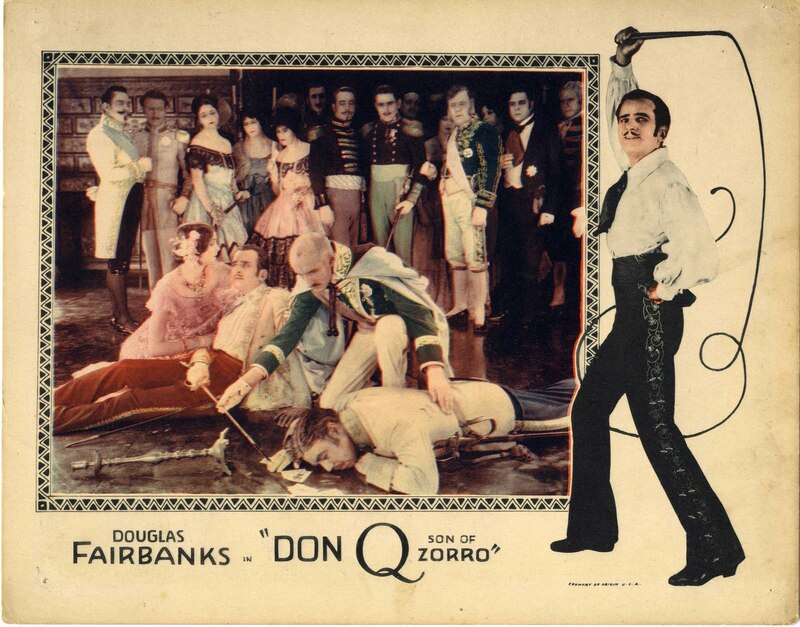 Don Q is available on DVD (packaged with Fairbanks’ The Mark of Zorro), courtesy Kino International. I saw the film live, this past Sunday, at Toronto’s Revue Cinema, where it appeared as part of programmer Eric Veillette’s ‘Silent Sundays’ series, now celebrating its second anniversary. Piano accompaniment was provided by William O’Meara. You can read more about Silent Sundays and the Revue here. Veillette’s website is Silent Toronto. A year ago I had the privilege of working on the Douglas Fairbanks Nitrate Stills collection, housed at the George Eastman House in Rochester, New York. While completing my degree in Photographic Preservation at the museum, I interned in the Motion Pictures Department, where I was introduced to the collection and put in charge of cataloguing its contents and ensuring its safe storage. The role of the still photographer in the silent era is an under-researched area of silent film history. More than simply producing publicity materials, the photographer aided the production in establishing a mood or capturing a character’s disposition. Without dialogue, the silent film actor conveyed emotion through the face and the body, and photography was often used as a testing ground for this. Over 10,000 negatives make up this collection. They were compiled by Fairbanks and donated to GEH in the late 1950s by his son, Douglas Fairbanks Jr. Today, they are part of the Department’s Motion Picture Stills, Posters, and Paper collection, headed by archivist Nancy Kauffman. The collection documents almost every aspect of Fairbanks’s career. There are some 1,500 negatives from The Thief of Bagdad alone, portraying every aspect of the film’s meticulous production design. It would seem that a photograph of every urn, every Persian carpet and every jewel was necessary. The same could be said for Robin Hood, with its 1,200 negatives. Fairbanks was his own producer, which partially explains the enormity of the collection—he exercised control over almost every aspect of his films, including Don Q. In digitizing and rehousing these negatives, I gained a new understanding of not only the films of Douglas Fairbanks, but what went into the production of films from the silent era. Often I stumbled across the most iconic of Fairbanks images, noting how meticulously retouched they were to make him appear youthful. And, how Fairbanks’s dark skin was lightened when he was photographed with Mary Pickford. Among these iconic photographs, there would be accompanying images; similar but not the same: often with a head turned, a slight change in the muscles of the eyebrow or a shift in the weight of the body—seemingly meaningless differences that actually altered the effect of the photograph. Knowing the control Fairbanks exerted over his own image, it’s hard to believe that he didn’t have some say in what photographs were published and which poses were utilized as emblems of his larger-than-life characters.